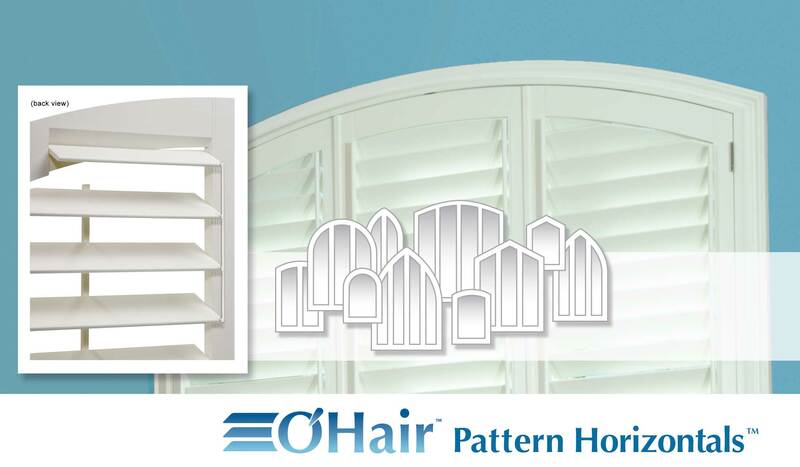 The Pattern Horizontal™ is engineered to precisely follow the curve of the window, eliminating stair-stepped edges while providing complete louver control. Unlike competing designs, there are no fixed louvers at the top to spoil the beauty of your window. It is ideal for curves, half-circles and rake-top panels. The exclusive rear-sculpted design with its concealed slimline tilt linkage provides precise synchronization for all louvers from top to bottom. Our exclusive Pattern Horizontal™ design has proven to be the style of choice for discriminating homeowners. Unlike competing designs, the louvers are fully synchronized from top-to-bottom using a cantilevered tilt system (see photo above) and they follow the curve of the window without the awkward stair-stepped look found in lesser designs.